The promise to make your web browsing more interesting if you use Magic Ball is misleading. This ad-supported program can be used in two ways: to promote the services of third-party advertisers and to generate profit for its developer (SuperWeb LLC). Needless to say, this program is not useful at all, and you should not rely on it to offer beneficial services. Instead, you should delete this adware from your PC. Do not panic if you don’t know how to remove Magic Ball, because this report explains it all. According to our researchers, Magic Ball is a new application, but this is not the reason why the installer on sparklymagicball.com does not work. All SuperWeb applications, including Product Deals and Insider Deals, have websites that seem to have been created only to advertise adware. Unfortunately, many users find that they need to delete these programs when they install software bundles. Some users might need to delete Magic Ball when they click the download buttons on unreliable sites. Magic Ball could be introduced to users by truly unreliable installers that could also represent more malicious software. For example, it is possible that you will download Magic Ball bundled with browser hijackers and intrusive tracking cookies. Malicious programs are more difficult to remove than some unreliable ad-supported program, which is why we suggest removing them before you delete Magic Ball. If you cannot identify malware, go ahead and install a malware scanner to assist you. 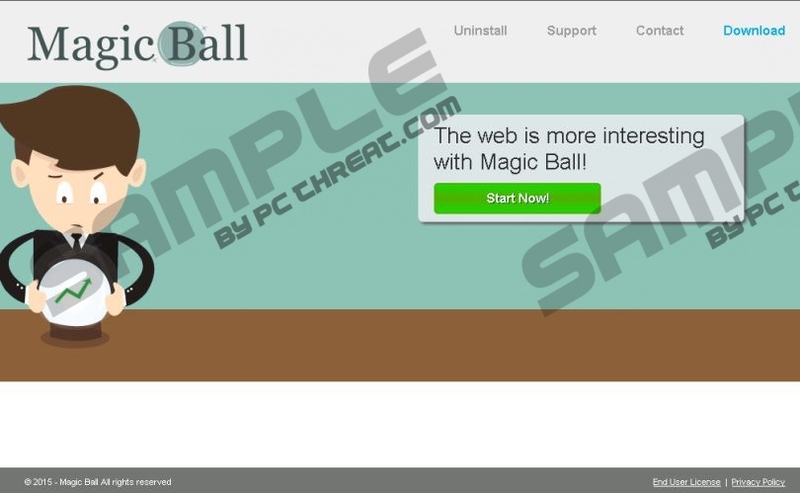 "Ads by Magic Ball" or "Provided by Magic Ball" are the tags that you might find attached to the banner and pop-up ads that will show up with the help of Magic Ball. These advertisements might be attractive, but their legitimacy is highly questionable. It is more likely that you will encounter misleading ads rather than authentic offers if you don’t delete Magic Ball right away. Make no mistake: Any advertisement might look reliable and beneficial if tracking cookies leak information about your browsing history. Many users are intimidated by the removal of Magic Ball, because they think that this operation is very complicated. In fact, to delete Magic Ball, you simply need to uninstall the undesirable program. Of course, it is impossible to say that you will be able to remove all unreliable programs manually, which is why we suggest implementing an automatic malware remover. Click the Download button to install the up-to-date malware removal tool SpyHunter. Quick & tested solution for Magic Ball removal.